Like the name states, Amphetamine Bearings are like stimulants for your wheels. This speed kit is designed especially for those looking to up their game in the quickness category. Amphetamine offers speed kits from Abec 5 all the way up to full ceramic. 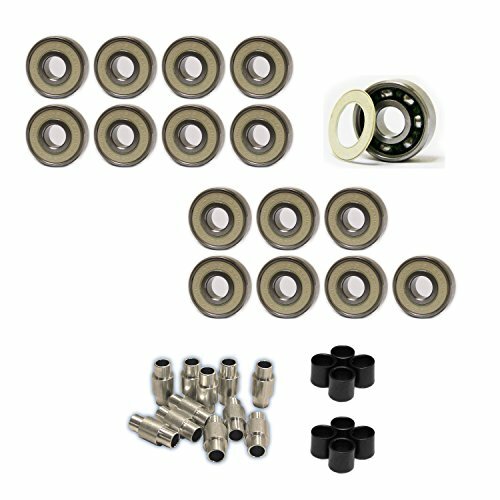 This is the Abec 7 Stainless Steel Bearing kit. This kit is a step up from the Abec 5 and standard Abec 7 kits and you will notice an immediate upgrade of speed. Stainless steel provides a bearing that can be used in any weather condition without the fear of rust. Double nylon shields protect the bearings from dust and other contaminates. FEATURES: Precision stainless steel rust free bearings - Grade 440 C steel for maximum hardness - Polished surfaces resist rust and corrosion - Improved performance in all weather conditions - Highest quality ball retainer on the market. Please note, this kit includes BOTH 6mm and 8mm bearings spacers. Depending on what type of axles your skate has, you will use one or the other, BUT NOT BOTH! Skates that have 6mm axles will use the stepped spacer while skates that have 8mm spacers will use the self centering spacer. If you have any questions about this product by Amphetamine, contact us by completing and submitting the form below. If you are looking for a specif part number, please include it with your message.